This recipe is adapted from an old recipe I’ve had for a long time This type of cake is often called a depression cake. Depression cakes were cake recipes created during America’s Great Depression, when many baking staples were rationed or prohibitively expensive. Thus, this cake is baked without the use of butter or milk, instead using oil and water. I did however, take the liberty of making a raspberry dairy free buttercream frosting using a vegan butter- because I love decorating cakes. This cake is incredibly moist and held together very well when I made it in the 9 inch pans. It has a pleasant fresh flavor. To enhance the lemon flavor of this cake, I used both lemon juice and lemon extract. 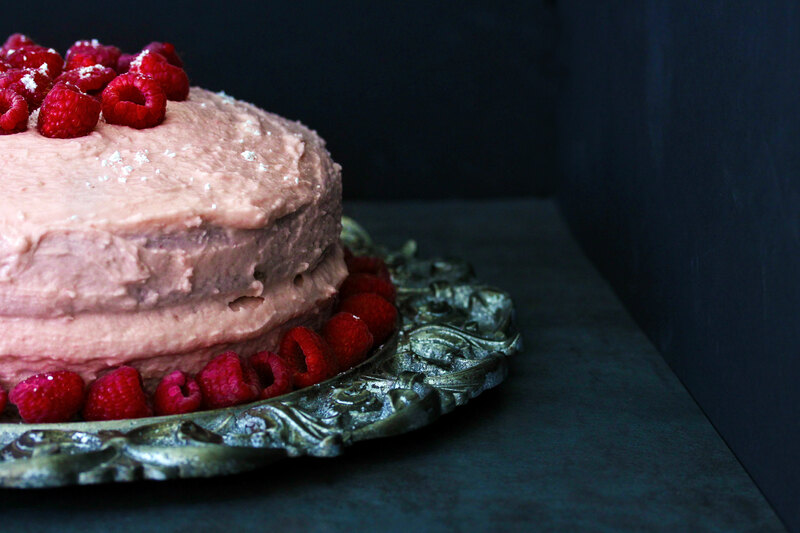 This Vegan Lemon Raspberry Cake recipe is adapted from an old recipe I’ve had for a long time called a depression cake. Depression cakes were cake recipes created during America’s Great Depression, when many baking staples were rationed or prohibitively expensive. Thus, this cake is baked without the use of butter or milk, instead using oil and water. I did however, take the liberty of making a raspberry dairy free buttercream frosting - because I love decorating cakes. This cake is incredibly moist and held together very well when I made it in the 9 inch pans. It has a pleasant fresh flavor. Combine wet ingredients with dry ingredients and whisk until smooth. Pour evenly into two 9-inch round baking pans. Bake on middle rack for 30-35 minutes, rotating the pans at the 15 minute mark. My oven and pans had them done at the 30 minute mark. test with a toothpick or small knife in the middle for doneness - it should come out clean, with no gooey stuck to it. When cakes are done, pull from oven and let cool for about 5 minutes, then carefully turn out cakes onto metal cooling racks. First, take ½ cup of fresh raspberries and puree them in a food processor or blender. Unless you happen to have gotten seedless raspberries, you’ll need to strain the seeds out. Using a mesh strainer and a bowl, pour the raspberry puree through the strainer. It’s quite a thick mixture, and the seeds may clog your strainer but don’t worry it’s an easy fix - I like to use the back side of a measuring cup to press the raspberry puree through the mesh - you want to get as much of that lovely raspberry flavor in your buttercream as possible. In a mixer, beat softened vegan butter, then add vanilla and lemon extract, plus the pinch of salt. Add powdered sugar, ½ of a cup at at time, beating on low to avoid a powdered sugar explosion, until you reach an appropriate buttercream texture that feels firm but spreadable. If your house is warm, you may want to chill your frosting for a few minutes before attempting to frost the cake. Once cakes are cool to the touch, transfer one cake onto a serving platter or cake stand. If your cake rose into a noticeable mound in the middle, at this point, you may wish to slice the top off so that you have a flat surface to work on. Spread the frosting onto the top of the 1st layer of your cake - you want about ½ inch of frosting layer. Then, gently transfer the 2nd cake layer onto the 1st. Center it, then frost the top, and then frost the sides. A spatula or butter knife can be a good tool here. Finally, sprinkle the cake with more fresh raspberries, and dust with powdered sugar if desired. Pour evenly into two 9-inch round baking pans. Bake on middle rack for 30-35 minutes, rotating the pans at the 15 minute mark. My oven and pans had them done at the 30 minute mark. Test with a toothpick or small knife in the middle for doneness – it should come out clean, with no gooey stuck to it. When cakes are done, pull from oven and let cool for about 5 minutes, then carefully turn out cakes onto metal cooling racks. First, take 1/2 cup of fresh raspberries and puree them in a food processor or blender. Using a mesh strainer and a bowl, pour the raspberry puree through the strainer. Because it’s quite a thick mixture, and the seeds may clog your strainer but don’t worry it’s an easy fix – I like to use the back side of a measuring cup to press the raspberry puree through the mesh – you want to get as much of that lovely raspberry flavor in your buttercream as possible. Add powdered sugar, 1/2 of a cup at at time, beating on low to avoid a powdered sugar explosion, until you reach an appropriate buttercream texture that feels firm but spreadable. If your house is warm, you may want to chill your frosting for a few minutes before attempting to frost the cake. Spread the frosting onto the top of the 1st layer of your cake – you want about 1/2 inch of frosting layer. Then, gently transfer the 2nd cake layer onto the 1st. Center it, then frost the top, and then frost the sides. A spatula or butter knife can be a good tool here.